First things first: WORK OUT. It started out rocky. My knees weren’t too happy for some reason. But once I warmed up, they felt pretty good. 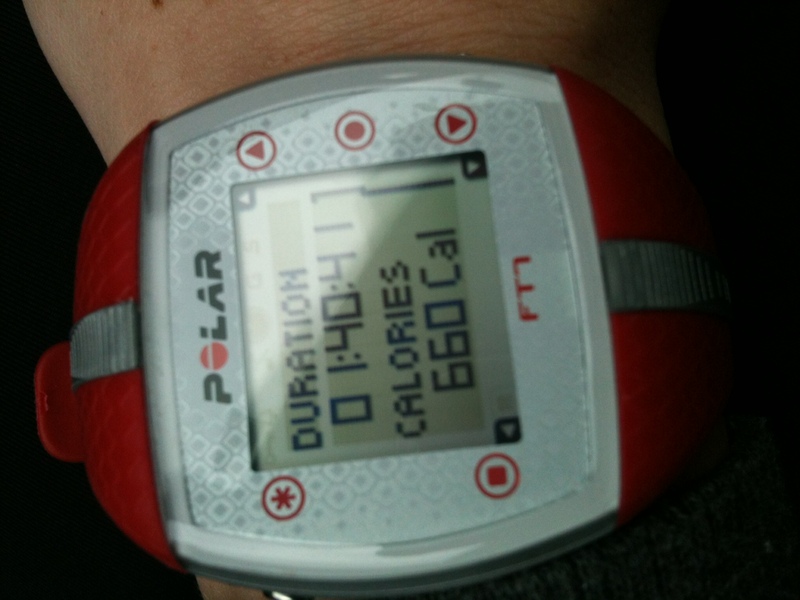 I started with the exercise bike at the gym, light resistance, and then worked out with the kettlebells and weight machines. I was feeling stronger and much better by the end of the session. After the gym, Michael and I went out for lunch. He was craving a burger and I didn’t care either way. The only things I’ve been craving lately are soup. The rain has returned to Portland and I think the gray, wet weather is making me hibernate early this year! 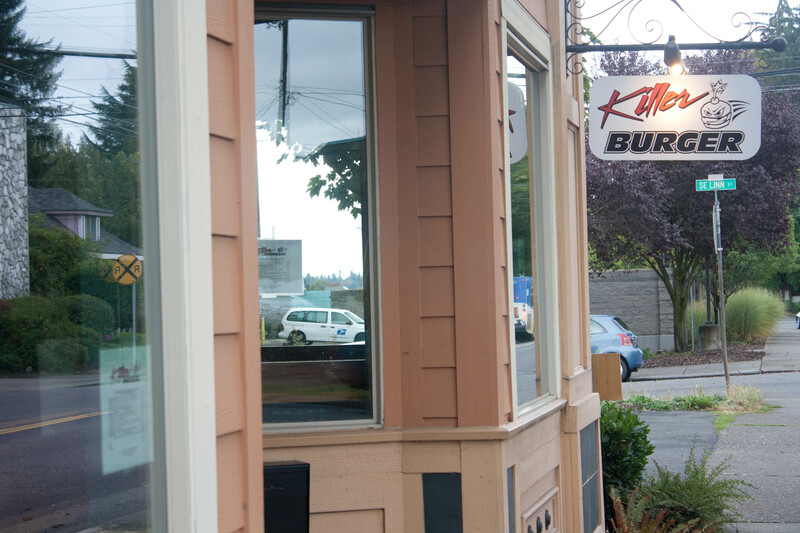 We went to Killer Burger in Sellwood. It’s a fairly new burger joint that Michael has been to before. He went when it first opened and said it was really salty. Because of that, I never had a desire to check it out. He figured it had been open long enough that maybe they’d remedied the salt thing. It wasn’t too crowded even though it was peak lunch hour. 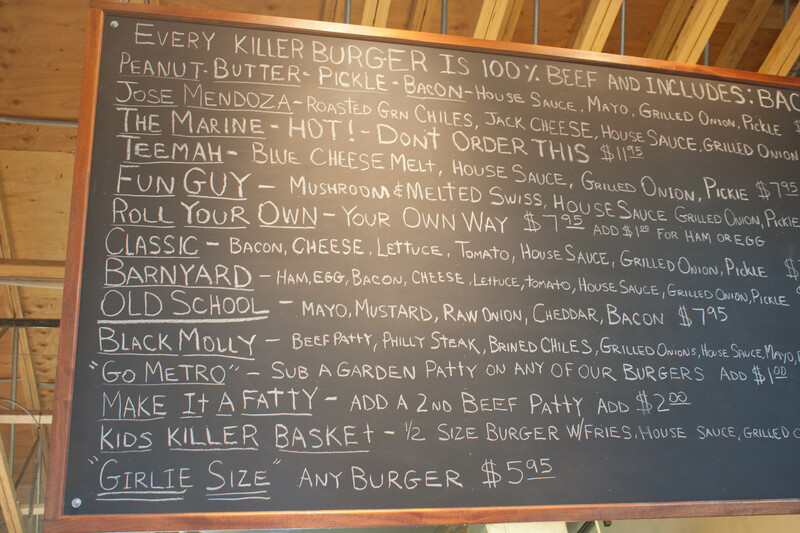 I had checked out their website before we went and I already knew that I was ordering the “Girlie” burger. It was essentially the child’s size burger. I ordered the “Jose Mendoza.” It was a small burger with Jack cheese and green chilis on it. It sounded really good at the time. Do you see the first option? Peanut Butter, Pickle and Bacon. Is that like “The Pregnancy Craving” Burger or what? Gross! Michael’s burger is on the right side in the photo below. He got the Swiss and mushroom burger. See the the size difference? I was glad my burger was small. It was the perfect size for me. The first few bites weren’t that impressive, honestly. The roasted chilies were kind of bitter. But the more I had, the more I started to like it and the bitterness was gone. I liked my burger but it wasn’t anything particularly special. It did not make my Best Burger List. Later that night, I made what *I* had been craving for dinner: soup! Broccoli Cheddar to be exact. I wish I could credit where I found this recipe, but I have no idea. It’s been in my stack of things to try forever. I’m so glad I finally made it! In large saucepan, coated with oil, saute onion until tender. Add garlic; cook 1 minute longer. Stir in flour until blended. Gradually whisk in broth. Bring to a boil, cook and stir 1-2 minutes until slightly thickened. Add the broccoli, tarragon, thyme and pepper. Return to boil. 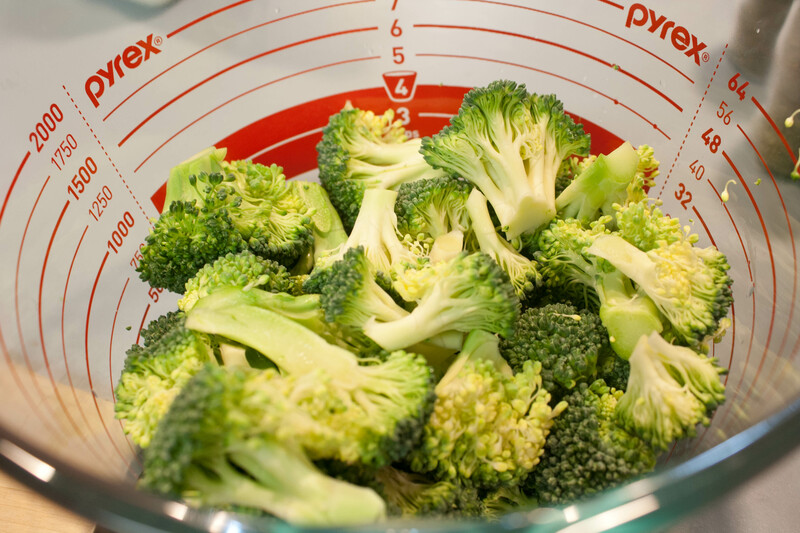 Reduce heat, cover and simmer for 10 minutes or until broccoli is tender. Add milk. Cook, uncovered 5 minutes. Remove from heat. 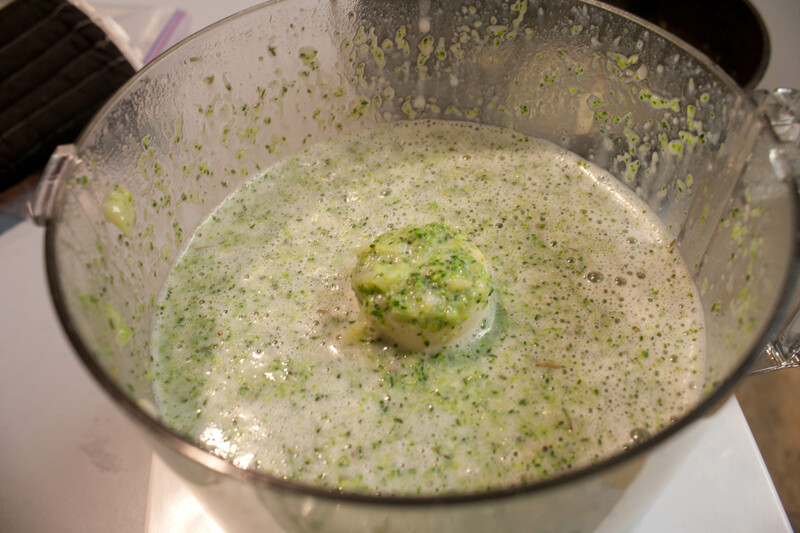 In blender, process soup in batches until smooth, Return to the pan. Heat through. Reduce heat. 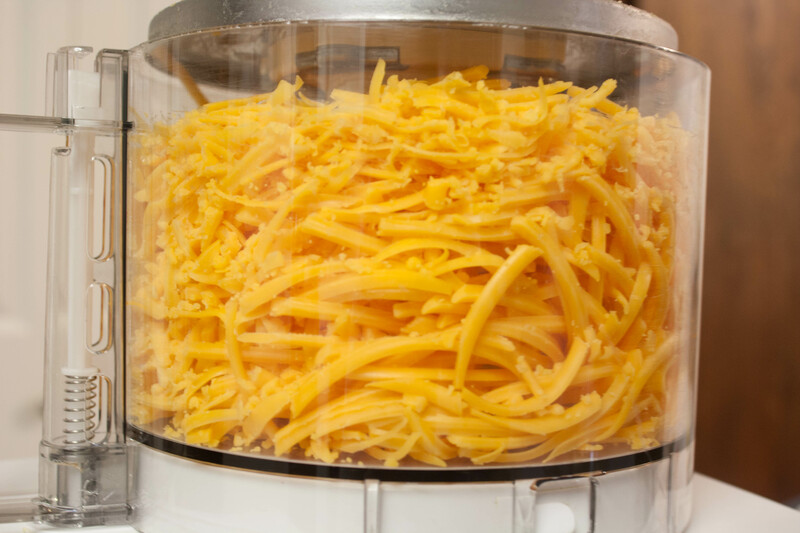 Add 1 cup cheese, stir until melted. Service immediately. Garnish with remaining cheese. The recipe was super easy. Michael shredded the cheese in the food processor for me and I chopped up the onions and broccoli florets. I used chicken broth because I was out of vegetable. Either would work well. 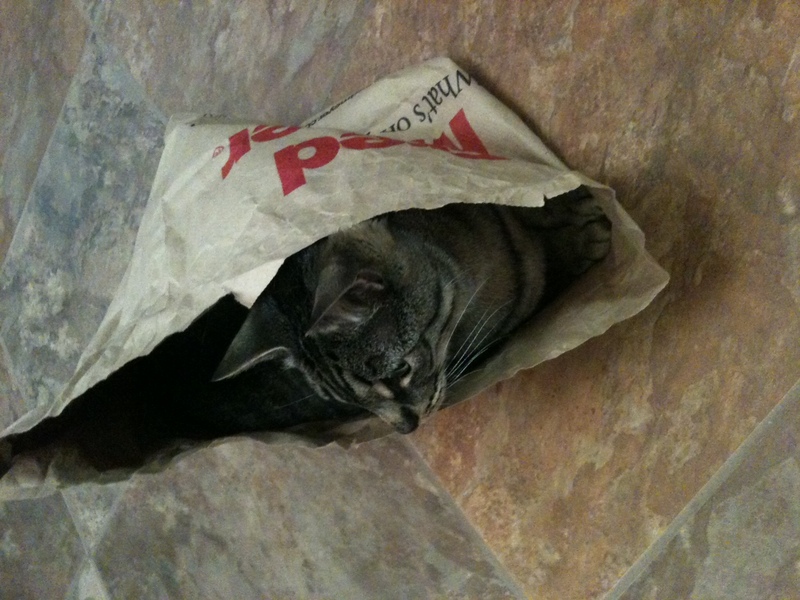 While I was cooking, Fat Kitty entertained himself with the grocery bag. I didn’t have tarragon so I used dried rosemary. I also added some salt, marjoram, and a dash of dried parsley. I sampled the soup as I went along and it was a bit on the bitter side. I added a small pinch of sugar and that fixed it right away. I didn’t need to use very much. While the soup was simmering, I baked some french bread (not from scratch, sadly). It was a whole wheat loaf with nuts and grains in it. It went perfectly with the soup. I sprinkled some shredded cheese on top of the soup when it was done. I LOVED the soup! 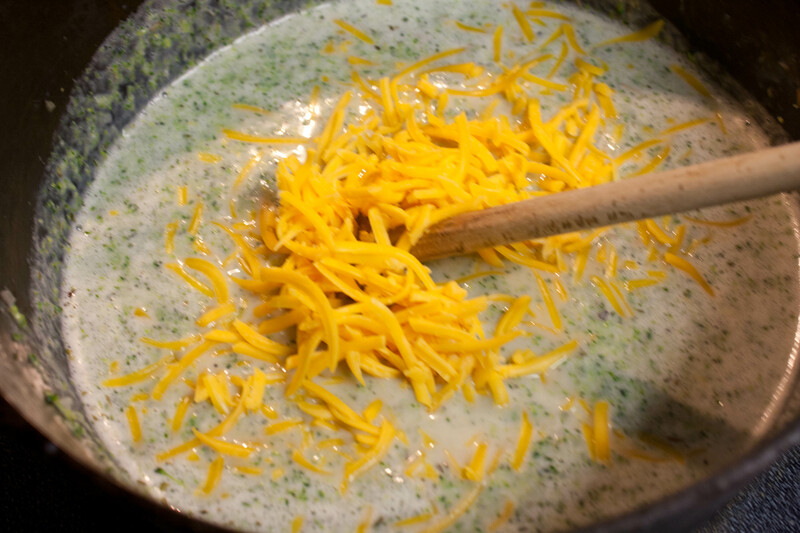 It had thickened up properly and the cheese. 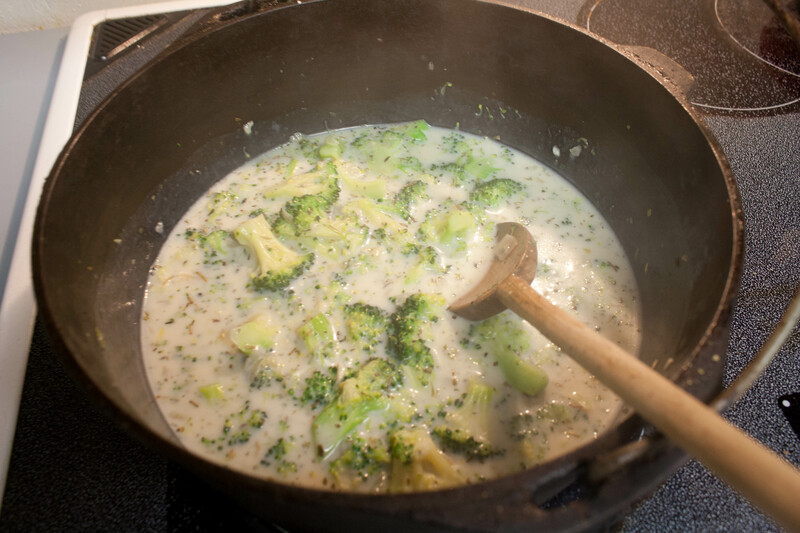 It was creamy and savory and the flavors of the cheese and broccoli were perfectly balanced. I was a bit sad that the recipe didn’t make more leftovers. I wanted to eat it for days. This was the perfect soup on a rainy, dark night. 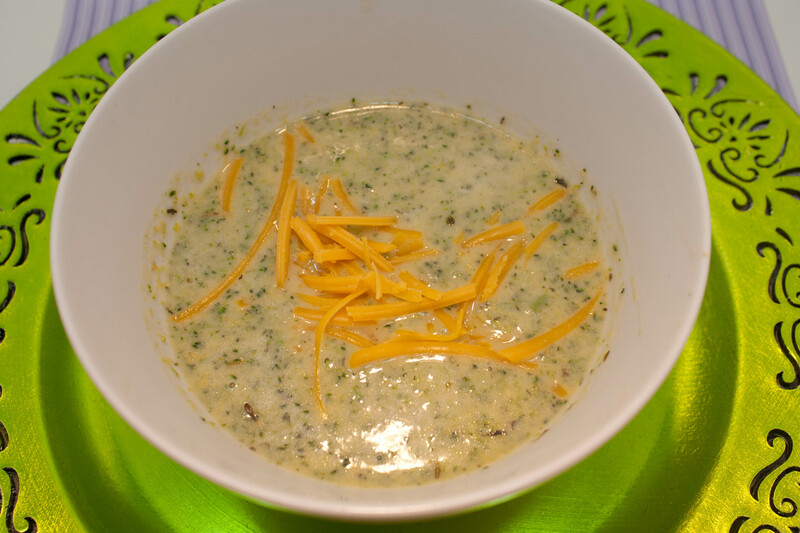 I loved how healthy it felt and I definitely liked it better than any store-bought broccoli cheese soup I’ve had. QUESTION: What is your favorite homemade soup? 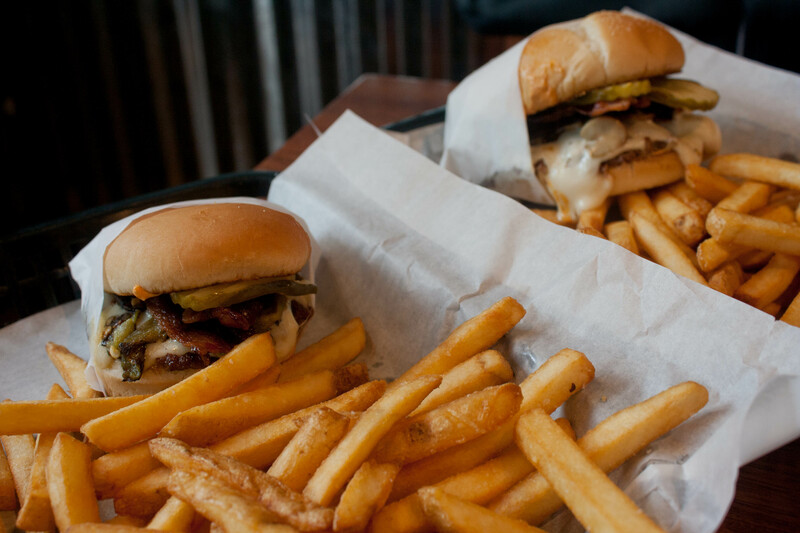 That soup looks awesome (as do the burgers). I need to make more soup on weekends for the work days. That’s what I did! I have leftover soup for lunch today. Which is perfect because it’s a gray day! I want to make more soup! Besides chili (does that even count? ), I’ve made soup maybe three times in my life. Funny thing is, one of those times, I just posted about today! And it was so good. I want to make a classic, healthy chicken and veggie soup next. I’m surprised you haven’t made soup more often! I love it because it’s so EASY to make. I had to go back and look at your recipe to compare. I missed it the first time that yours had potato in it. Do you think the potato made it better? Yum to amazing looking soup! I have a book that I love called Artisan Bread in 5 Minutes a Day that lets me make all kinds of great, healthy bread in a flash. I highly recommend it if you are interested in homemade, fast bread. I will see if my library has that book. I’d love to make my own bread! Its soup season here too. I made light potato and leek soup yesterday. Love that the restaurant offers smaller portions. I wish more places would do that. Have a wonderful Monday Lisa!!! I wish more restaurants had smaller portions, too! Your soup sounds great. Recipe? I love chowders! Clam, potato, etc. Peanut butter on a burger not so bad, but with pickle is really, really gross! – and adding onion to that really puts it on barf level. 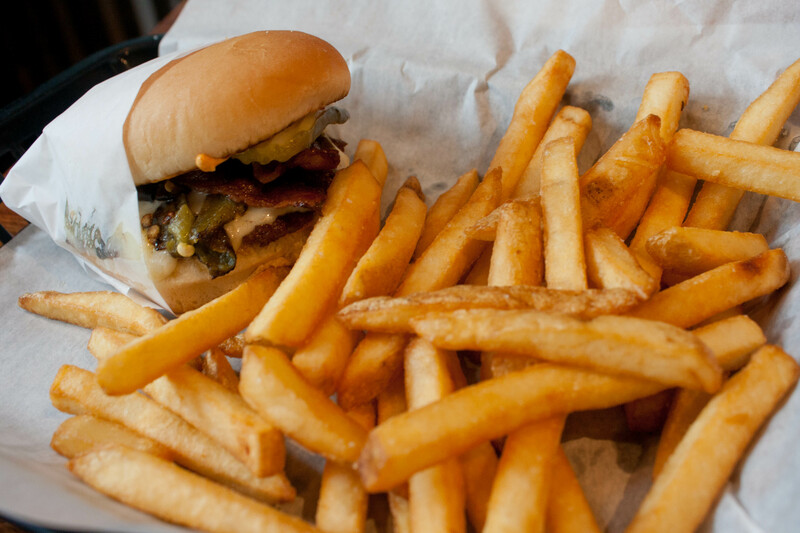 Have you tried peanut butter on a burger??? 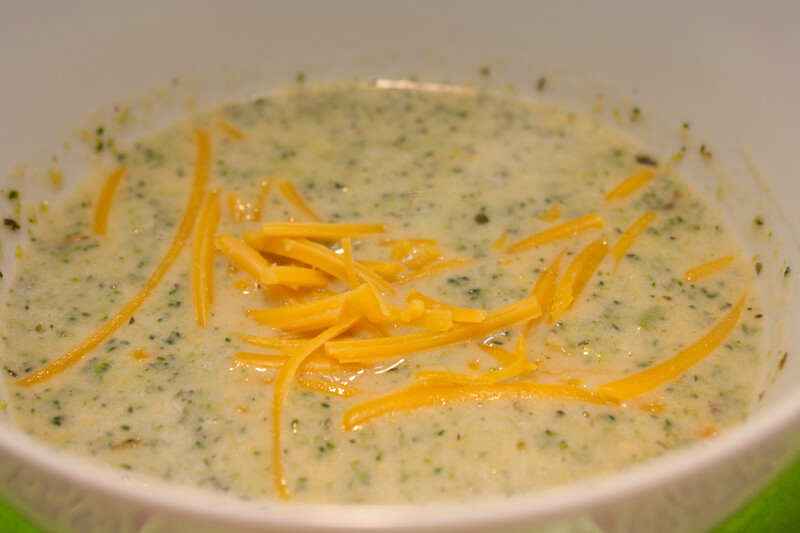 I love broccoli cheese soup. thanks for the healthy recipe. My favorite soup is buffalo chicken, but I love chilli. What is buffalo chicken soup? I’d love to see the recipe. I don’t know that I’ve ever had it.